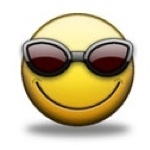 Smiley - Cool (for picks). Part of my collection of commonly used gambar for fanpop picks.. Images in the fanpop club tagged: picks.